When it comes to international adoption, there is no one-size-fits-all set of rules. Every country is unique. Requirements can and do differ from country to country. If you are considering adopting a child from Colombia, this article will outline some of the basics you should know. Colombia is a South American country on the northernmost part of the continent, bordered by Panama to the north. This lush country is one of the most ecologically diverse in the world, featuring rainforests, mountain landscapes, grasslands, coastal regions and more. The country is also ethnically diverse. There is no one-size-fits-all Colombian. That said, this country of 40 million primarily speaks Spanish. Roman Catholicism is the dominant religion there. The country has been on the upswing in recent years, winning a seat on the U.N. Security Council, making strides on human rights, and making tremendous steps towards peace for the first time in a sometimes tumultuous 50 years. Colombian children may have a wide range of ethnicities, from Hispanic to indigenous / native, Afro Colombian, and mixed ethnicity. Children in need of a home in Colombia are often placed in orphanages, private homes or group care. These facilities can be either private or public in nature. Children are placed in such facilities due to poverty and/or single mothers being unable to support them, or because the children were removed from their home due to neglect, abuse, or incarceration. In 2015, just over 150 children from Colombia were placed in U.S. homes. Colombia is a Hague Convention nation, meaning it adheres to the international treaty that oversees international adoption. It is one of 94 countries to sign on board. 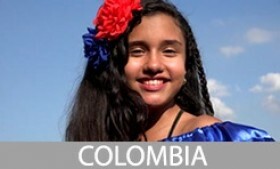 There are age requirements for adopting from Colombia. Parents must be at least 25 years old, and the oldest parent must be no less than 15 years older than the youngest child being adopted and no more than 45 years older than them (though some exceptions may be approved, on a case-by-case basis). Parents must be married for at least three years, and are allowed no more than three divorces each. Single parents may adopt, but there are restrictions depending on gender. Single women may adopt children with special needs or sibling groups, as well as any child over the age of ten. Single men may only adopt boys older than 10. 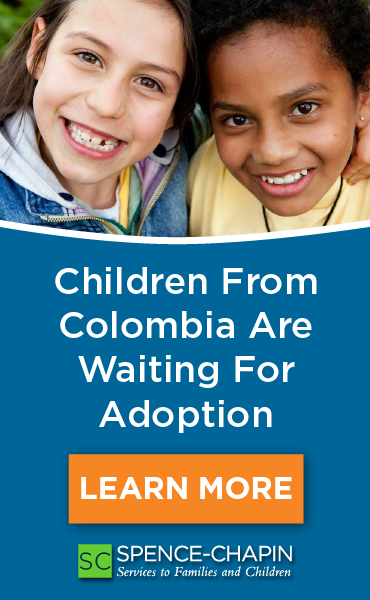 Adoption from Colombia requires one trip, which can range from 3-5 weeks. A 10-day period living with the child is required. At least one parent must stay in Colombia throughout the adoption process. International adoptions from Colombia are similar to other international adoptions, with a few minor differences depending on your unique situation, so if you’ve researched international adoption options you should already have some understanding of the process.